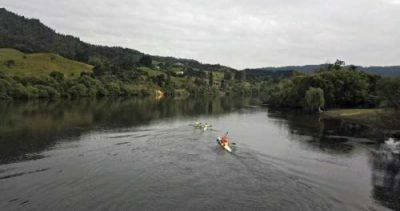 The inaugural Waikato 100 river event was held on the 25th November 2017 with 140 athletes taking to the water either by rowing, kayaking, paddle boarding or in waka ama. Waikato River Authority was one of the sponsors of the event. The event covers over 100km of the Lower Waikato River, where athletes must navigate there way down. Participants had the choice of taking part in a relay or completing shorter course options between the start at Waikato Rowing Club in Hamilton, and the finish at Elbows Ski Club 15 kilometres from Port Waikato. The event is a good way to promote and showcase the beautiful and significant sites on and along side the Waikato River, while also gaining a first hand look at some of the challenges that the river must face. Among those taking part in the event were brothers Tim and Nicholas Manukau who endorsed the experience as a way to connect more people with the river and to create more advocates for a healthy awa. The event attracted national media coverage and event organiser Rob Hamil expects further interest and growth in the years ahead.